Businesses are organisations that create products for customers. Buyers and sellers of products meet to perform transactions (usually the product is exchanged for money) at markets. Businesses produce products because their customers either need or want them. Customers purchase products and consumers use them. The word ‘Consumer‘ can also be used to describe a person who purchases products for personal use, whereas ‘Producers‘ are customers that purchase products to help make new products. This creates different types of products; Consumer goods, Consumer services, Producer goods (also called Capital goods) and Producer services. Producing products requires resources. There are three types; Natural resources (Land), Human resources (Labour) and Manufactured resources (Capital). These resources (often referred to as the Factors of Production) are combined by an Entrepreneur (Enterprise) to create the products that can be sold to customers. Successful businesses are those that provide ‘added-value‘. This means that the price of a product is higher than the cost of producing it. When value is added a business will make a profit. What are the main business functions? Working out how many and what type of people are needed to produce the products of the business. Recruitment and retrenchment. Dismissal. How to maximise the productivity of workers through training and motivation. Dealing with issues that workers have. Works out how much money is required to run the business. Looks at how best to raise this money and how to make the best use of the money available. Creates financial accounts showing how well the business performs. Works out what kinds of products customers want and are willing to buy. Considers what prices to charge, how to promote the business and how best to deliver the product to the customer. Looks at how best to make the product and how to manage the resources needed in the production process. Is concerned with maintaining high product quality and also conducts research and development of new products and processes. 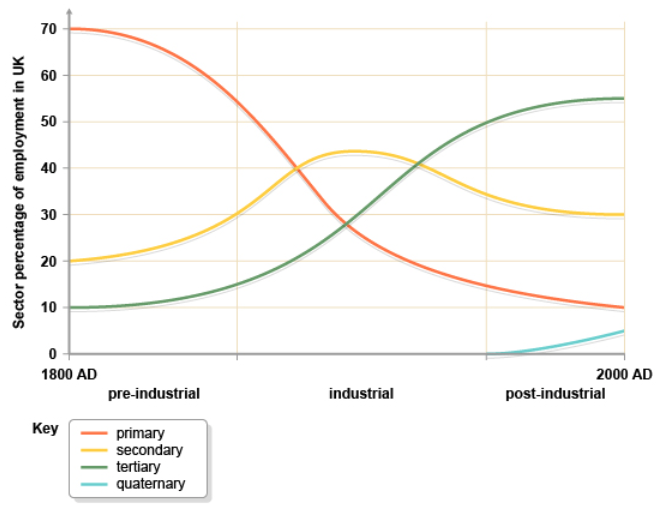 What are the sectors of an economy? All businesses operate in one of four economic sectors; Primary, Secondary, Tertiary & Quaternary. Primary – Obtaining natural resources e.g. a farmer growing corn or a miner excavating iron ore. Secondary – Producing manufactured goods e.g. a factory that makes mobile phones. Tertiary – Providing services to consumers and businesses. Note, the product is intangible. E.g. a cleaner cleaning an office or a hair dresser cutting hair. Quaternary – The knowledge-based part of the economy. Includes services like business consultancy, information technology, financial planning, education, and research and development. Entrepreneurs are vital to the economic growth of economies. Take this quiz from the BBC to find out if you have what it takes to start a business enterprise.